The Pancha Bhoota temples are dedicated to Lord Siva. Pancha mean five and Bhoota means elements. The five basic elements are earth (dharti), water (neer), fire (agni), air (vayu) and sky (aakash). These set of five temples are considered to be of great importance in south India. According to hindu mythology the five Siva lingas in these temples represent the five elements. The first temple is Ekambareshwar temple. It is located in Kanchipuram in the state of Tamil Nadu. This temple signifies the element earth. The presiding deity here is Siva who is worshipped here as Ekambareshwar. The Shivlinga here is known as Prithvi Lingam. The second temple is Jambukeshwar temple which is in Tiruvanaika. The Siva linga here signifies the element water. This ancient temple is dedicated to Siva and Parvati. Lord Siva is worshipped here as Jambukeshwar and goddess Parvati is worshipped here as Akhilandeshwari. The third temple is Annamalaiyar which is in the town of Tiruvannamalai in the state of Tamil Nadu. The Siva linga here represents the element fire. It is believed that Lord Siva appeared here in his ardhanarishwar form to bless his devotees. The fourth temple is Srikalahasti temple which is situated in Chitoor district of the state of Andhra Pradesh. The Sivalinga here represents the element air. Lord Siva is worshipped here as Srikalahastishwar and goddess Parvati is worshipped here as Gnanaprasunambika. 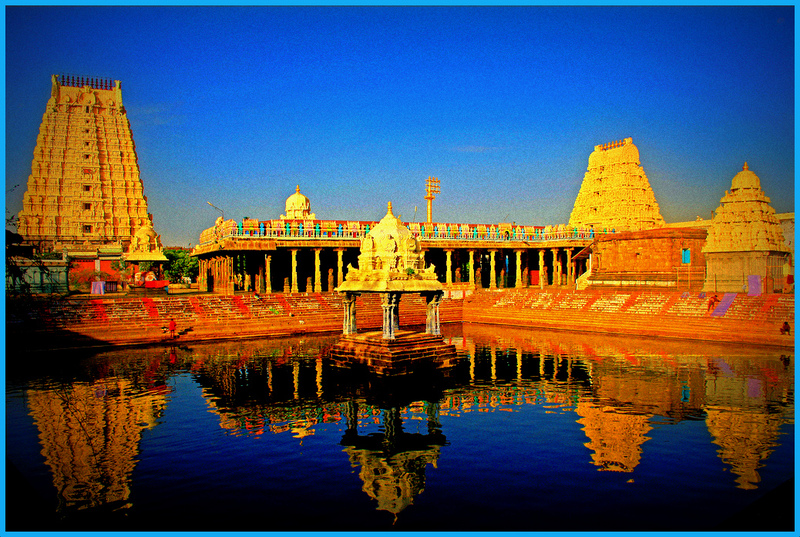 The fifth temple is Chidambaram which is in the town of Chidambaram in the state of Tamil Nadu. Lord Siva here is in the form of the cosmic dancer Nataraj. This temple is dedicated to both Lord Siva and Vishnu. The sivalinga here represents the element sky.